Sunny. High 78F. Winds S at 5 to 10 mph.. Sounds of Silence: Why does Highland Park’s community bandshell sit empty most of the year? Weekends usually find Sycamore Grove Park in Highland Park busy with families celebrating birthdays, kids jumping around the playground and customers lined up at the mariscos trucks parked on Figueroa. But in midst of the lively parties and noisy kids, the bandshell in the center of the park is usually quiet, the rows of bleachers nearly empty. In fact, the Sousa-Hiner Bandshell is rarely booked for concerts or events. A recent call to the city’s Recreation and Parks Department, which manages the facility, revealed that you could pretty much book the bandshell any day this summer without a problem. But there are few takers, with some residents blaming high fees charged by the department for allowing the bandshell to sit silent most of the year. For example, when the Historic Highland Park Neighborhood Council inquired about booking the bandshell for a series of free, outdoor movies this summer, the organizers decided to drop that idea when they were informed of the costs: $400 for the first two hours in addition to a $75 reservation fee, a $50 electrical hook up fee and a $150 refundable clean up deposit. Additional hours would cost $75 each. Despite being associated and overseen by a city agency, the Highland Park neighborhood council members were told the fees could not be waived. 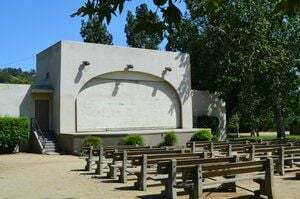 “Our goal is to eventually move these movie night events to the beautiful Hollywood Bowl-eque bandshell that we have in Sycamore Grove Park, a community asset that is woefully underutilized,” said council board member Aaron Salcido. It “makes no sense to use city money to pay for a city venue,” said fellow board member Terri Bonsal. Given the city’s financial condition, it does not look like the Recreation and Parks Department is about to waive or lower those fees. Never has the eerie, moonlit facade of the Southwest Museum gazed down from its lofty aerial lookout upon a finer or more enthusiastic throng. Never have the graceful arms of the venerable sycamores embraced more loving the shell-like rostrum where sat as honored guests ….the gracious men, women and little folk whose artistry so many times lent keen delight to the sounds of Southern Californians. In 2006, the bandshell was named in honor of dentist-turned band teacher Edward M. Hiner, who lived across the street from the park, and conductor and composer John Philip Sousa, who visited Hiner several times over the years. Some of the groups that have used the bandshell in recent years speak highly of the location. Organizers of Lummis Day, a celebration of Northeast L.A. culture and history, used the bandshell for several years at a reduced rate. But the festival was forced to move after Recreation and Parks raised its fees, said Eliot Sekuler with the Lummis Day Community Foundation. Last June, the bandshell hosted bands and storytellers as part Urban Rancho, a series of events that promote sustainable gardening and living as well as local history and culture. “I thought it was great,” said Katherine Parra of Urban Rancho. The park staff was very helpful, even filling in gopher holes and handling clean up, she said. But, Parra, concedes, she could not have used the bandshell without the help of Council District 1, which handled the permitting and fees, she said. Without similar help, Parra said she could not afford to hold the event at the bandshell.